Texas Baptist Men secured a historic 1942 DC-3 to deliver supplies to sites from Rockport to Orange in the aftermath of Hurricane Harvey. TBM also coordinated a caravan of trailers loaded with hay for livestock for the Golden Triangle area and drove vans filled with disaster relief volunteers to more than two-dozen locations along the Gulf Coast. Meanwhile, other TBM volunteers provided child care and chaplaincy services at a shelter for Hurricane Harvey evacuees set up at the Kay Bailey Hutchison Convention Center in downtown Dallas. Jim Terry from Texas Heritage Historic Planes provided the use of the vintage DC-3, and TBM sent supplies to Rockport, Ingleside, Fulton, Orange and other locations. “Over a weeklong period of air supply missions, we airlifted 31,000 pounds of supplies all over South Texas,” said John Travis Smith, TBM chief operating officer. Although floodwaters rose to within 10 feet of the front door at First Baptist Church in Orange and within 15 feet of its back door, the facility sustained no damage. So, the church served as one of several distribution sites for donated items and received a planeload from TBM. “Have you ever been to a Black Friday sale? That’s what it’s been like around here. Things have just been flying out the door,” Pastor Barry Bradley said. In addition to the Texas Baptist-provided supplies, the church also has received donated items from California, New Mexico, Oklahoma, Michigan, Ohio, Missouri, Louisiana, Mississippi, Alabama, Georgia and North Carolina. While First Baptist in Orange received diapers, bottled water, cleaning supplies and tools, Cowboy Church of Orange received hay. Farmers and ranchers suffered a serious shortage after Hurricane Harvey, but TBM coordinated delivery of trailers loaded with more than 200 hay bales for livestock. TBM volunteers worked alongside Baptist partners from 18 other states to provide disaster relief ministries in 25 sites. As of Sept. 11, they had donated more than 84,000 volunteer hours and made about 8,500 contacts. Baptist volunteers prepared about 585,000 meals, purified more than 16,000 gallons of water and delivered more than 1,500 boxes to people who needed them to collect and store their scattered belongings. They completed more than 300 chainsaw jobs and more than 120 mold-mitigation jobs. Volunteers distributed more than 1,500 Bibles and 1,000 tracts, and they recorded 66 professions of faith. They also provided access to more than 8,400 showers and washed about 5,600 loads of laundry. Steve Price from South Garland Baptist Church in Garland worked with a TBM crew in Victoria. His primary responsibilities included patrolling the area at night to provide asset protection and serving as a volunteer chaplain in the daytime to provide spiritual counsel. However, he also assisted with a shower and laundry unit, and he wrote about his experience in a Facebook post. “One of the chainsaw crews was helping remove a tree from an elderly couple’s home. The homeowner mentioned that she and her husband, who was an Alzheimer’s sufferer, had not showered in five days,” Price wrote. A team member invited the woman and her husband to use the shower and laundry unit at the church where the TBM team was stationed. “The couple arrived and were kindly attended to by our Ellis County volunteers who ran the unit,” Price wrote. They allowed the woman to shower and to assist her husband in showering. Before they left, the woman expressed her deepest appreciation for the team’s patience and understanding. “When the shower team went in to clean the stalls, they found sand covering the floor the drain,” a testimony to just how desperately the couple needed the service, Price wrote. TBM has helped to establish Volunteer Villages in several locations with the cooperation of Texas Baptist churches. 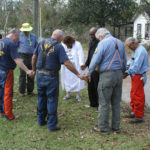 Churches near affected areas receive short-term volunteers from other congregations around the state and provide them with basic overnight lodging, typically in a gymnasium or other church facility. TBM supplies assignments for the volunteer crews. For more information, click here. To contribute financially to TBM disaster relief, click here or send a check designated “disaster relief” to Texas Baptist Men, 5351 Catron, Dallas 75227.